Choosing the best work socks for your work boots can be a daunting task. You spent a long time looking for the perfect pair of boots only to find that you still experience foot trouble at the end of the day. You need a few things to help your work boots do their job. Socks are going to be the difference between mediocre boot performance and excellent performance. It’s important to find the right pair, and in this article, we’ll show you our picks for best work boot socks so you can make the best decision for your feet. These have an extra thick toe and heel, and the arch of the sock is reinforced to make sure that your sole gets proper padding and arch support. They are heavy duty socks and will work well with jobs that require standing on your feet for long periods. The midweight blend of materials helps skin around the foot breathe and allows the wearer to feel more comfortable throughout the day, particularly in jobs where conditions are hot. These feature a blend of synthetic fibers that maintain their shape despite extended wear and stay in place even in jobs that require a lot of movement. They are tight, but won’t leave deep marks. 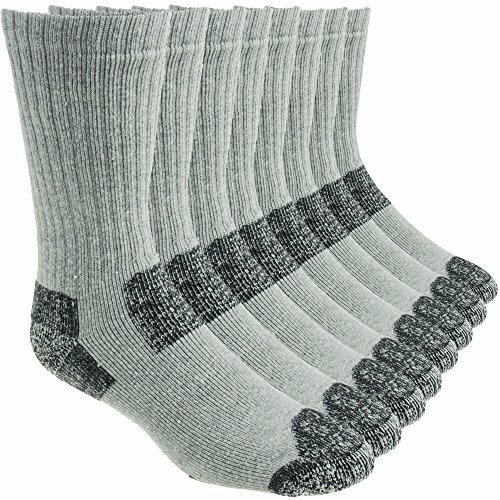 These socks feature a wool blend that helps to maintain insulation while wicking moisture away from the feet. The fit is tight to prevent slipping, and they will help the body regulate the temperature of the feet well. The Performance line specializes in moisture wicking and breathability. It features ventilation channels woven into the fabric to make sure that the skin can breathe even when wearing boots in summer. They are comfortable and help control odor. The Gold Toe Ultratec socks are a majority natural fiber socks made of cotton. Cotton is a comfortable, stretchy material that breathes and feels less dense on the feet. They are also softer than many synthetic blends. Many factors go into choosing a sock for a work boot. It’s a little more complex than just deciding on a color. If you work predominately outdoors, you’ll want to think about what kind of weather conditions you’ll have to deal with. Is it mostly hot? Mostly cold? How much rain will you have to deal with? Weather conditions require different kinds of socks. Natural fibers are better at insulating against extreme cold, so you should look for materials such as wool if you will be outside in snow and ice on a regular basis. On the other hand, heat needs breathable fabric, and while cotton may seem like a good choice, there is also the moisture wicking quality of polyester. Another consideration is the type of activity. If you spend extended periods of time standing on your feet, you’ll need a sock with a reinforced toe and heel plus cushioned arch support. The extra padding on the bottom of the sock will help displace the shock of standing on your feet all day, particularly if it’s on a concrete floor. If you spend a lot of time walking, you’ll want a sock that maintains its shape and doesn’t ride down your leg. Socks with reinforced bands or ankle bracing support the leg and ankle and keep socks in place as you move around. Socks are socks, right? Not quite. There are several features and parts of socks that you can consider when choosing the one that’s right for you. Extra padding can help the comfort of your feet, especially when working on flooring like concrete. 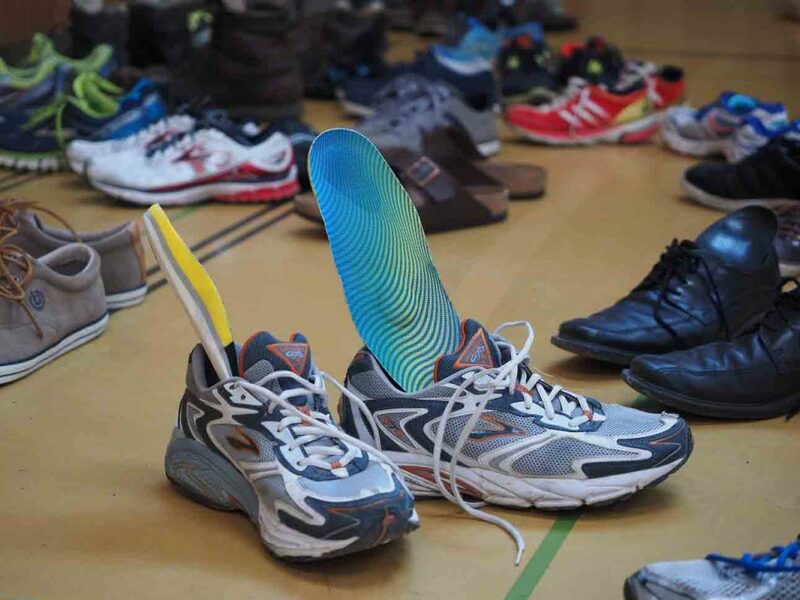 Padding is achieved by weaving type, or by combining materials to produce a thicker sole. Be sure that the padding of the sock doesn’t inadvertently cause more problems by altering the natural fit of your shoe. If the padding causes the shoe to fit too tightly, this will work directly against the benefits of the padding. The height of the sock can help alleviate the pressure points of a work boot. Taller socks fit better around the calves and provide insulation for people working in outdoor climates where the weather gets colder. Shorter socks provide ankle bracing. The height of the sock is important to prevent abrasion from boots, and you should always try on socks with boots to make sure they prevent direct contact between your skin and the boot. You'll also need work socks that stay up. Socks can offer arch support with reinforced mesh. Without proper support, even those without high arches can develop pain without proper support. You can also find socks with ankle bracing to help support the movement of the ankle and reinforce the protection of your boot. Ankles can be weak joints and with extended walking will need more support to prevent injury. You can also find compression socks if you suffer from poor circulation. Standing on your feet all day makes circulation problems worse and so compression socks can alleviate these symptoms without you having to put your feet up at inopportune times. Not all socks have the same sizing and shape. When you buy socks, pay attention to how they fit in the toe and heel. If the toe area is too large, this can cause unnecessary chaffing in the toe area. 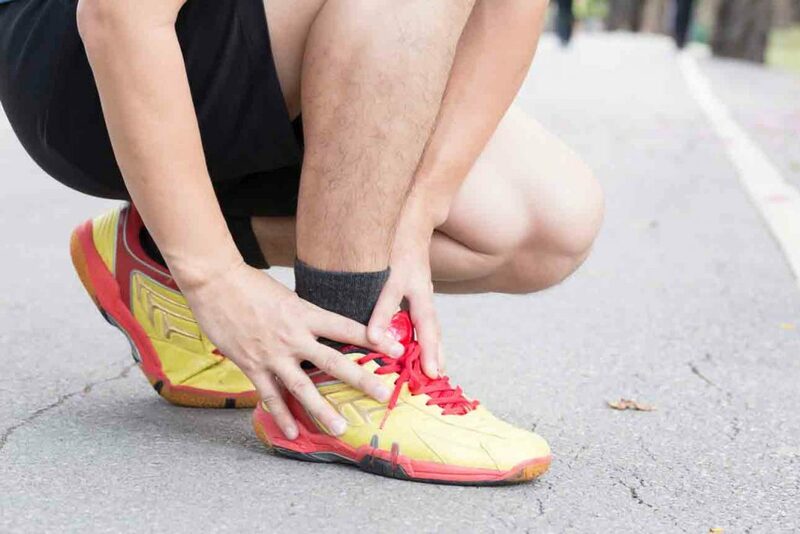 If it’s too small, it can encourage blisters in between toes. Heels that move up towards the ankle prevent the ankle from receiving proper support. Socks that slip below the heel placement encourage blistering in the heel area. 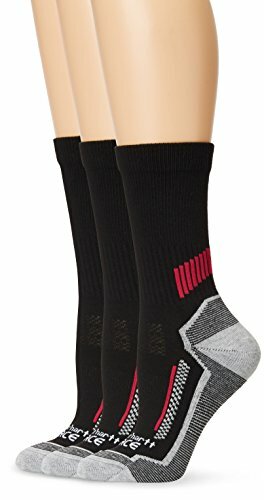 Socks should fit tight enough in the calf to prevent them from sliding down as you move, but not so tight that they cause deep impressions in the skin. The most comfortable work socks will be ones with correct fit. Any piece of clothing requires a decision between natural and synthetic fibers. Natural fibers have the ability to be softer and easier on sensitive skin than synthetic. Materials like cotton are requisite for softness, which can lead to more comfortable wear especially if your job requires standing around on your feet. Natural fibers like wool also have built in antimicrobial properties. If you have trouble with things like athlete’s foot because of moisture control, then a natural fiber can help you manage that environment. A disadvantage of natural fibers is that they often don’t last as long as synthetic. Heavy, frequent laundering can rob the material of its elasticity and cause it to pill. These disadvantages make it so that you might buy socks more often than you would normally. Synthetic fibers have a bad reputation in some organic circles, but science has helped us redefine how materials can function in extreme environments. Synthetic fibers can help the body wick away moisture, for example. Moisturing wicking work socks are a good idea. Keeping moisture off the feet is a clear choice in extreme heat, but it also helps maintain insulation in the cold. Keeping the feet warm can sometimes cause sweating, and when moisture remains on the skin, the body has to work harder to keep warm. Blending synthetic fibers with natural ones keeps this from happening. Synthetic fibers also help material maintain its shape. Nowhere does shape matter more than in socks. 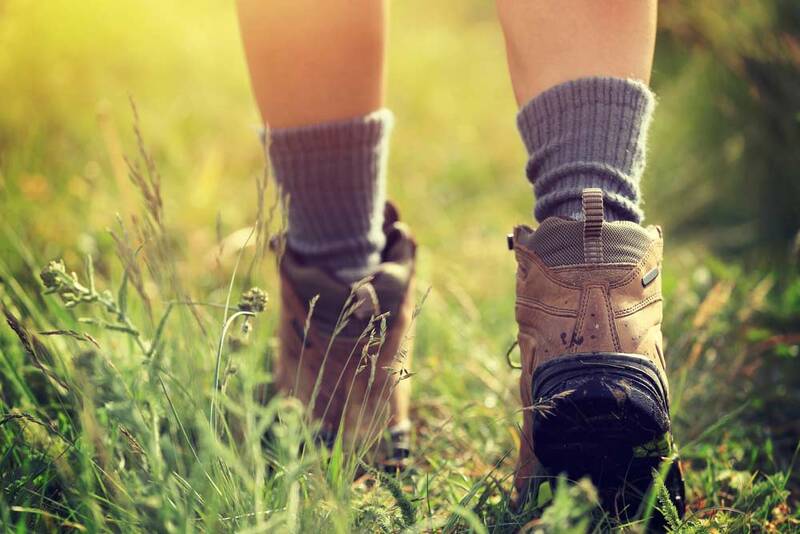 People who walk long distances in boots develop blisters and sores if the sock moves and rubs over a period of time, and those standing on their feet lose compression when the sock slips down the calf and ankle. Boots themselves have little flexibility, and so the shape of the sock helps maintain range of motion. A sock that bunches around the ankle prevents normal ankle movement, and so it's important that the material molds comfortably to the shape of the calf, ankle, and foot. A disadvantage of synthetic fiber is that for sensitive skin, they sometimes don’t feel as comfortable or natural. Poor synthetic blends aren’t breathable, and while they may wick moisture, the ability of the skin to find air flow is important to keep down overall moisture and bacteria or fungus. Odor control is a frequent concern for those who wear heavy work boots. Regular socks and dress socks are prone to odor due to the material of the sock. When the feet sweat and that sweat remains on the skin, the natural flora of the skin feeds on the sweat and reproduces. This overabundance causes odor. Wet feet are also likely to develop skin irritations including fungus buildup. If you have problems with athlete's foot, doctors recommend ventilation of the foot, but this isn't possible in jobs requiring work boots. To alleviate some of these symptoms, socks that are antimicrobial can be a good choice. One benefit of choosing a work boot sock is how the right sock can help you break in new boots for better performance. Thicker socks can help to stretch out boots where they need to be stretched while preventing stiffness from causing blisters. Socks with natural fibers such as cotton are perfect for this type of thickness. Although boots with a steel toe won’t change much in that area, the right socks will keep the stiffness from rubbing against your skin until it becomes more pliable with your movements. One way to break in boots is to wear them a little every day until they feel comfortable. Having a good, thick pair of socks is important for this because you don't want to rub blisters into your feet while trying to break the boots in. Another thing you can do is layer your socks to force the leather to give just a little. This stretching allows the boot to conform to the movement of your feet and reduces chaffing from stiff leather. There are a few things you can do to help your work socks last longer. The first thing to do is to keep your toenails properly trimmed to prevent speedier wearing at the toe area. The second thing to keep in mind is that washing moisture wicking socks repeatedly with fabric softener can affect the material’s ability to do its job. Instead, keep them away from laundry loads that require fabric softener. You might want to invest in a small laundry bag so that socks stay together and don’t get wrapped around larger pieces during laundry cycling. Repeated stretching in this manner can affect the fit and elasticity of the socks. You can also lay socks flat, or fold them in half to help them maintain their shape. Tucking and folding the opening of the sock over another can wear out the fit of the calf or ankle over time. If your socks have wool or cotton, washing them on a gentle cycle inside out can help prevent wear and pilling. Natural fibers require greater care, and although it can be tempting to wash heavily soiled socks in a high cycle, gentle is still best. Dry on low heat or lay socks flat to dry. If your socks have mostly nylon, cold water is best. It is also a good idea to wash them in a garment bag to prevent the nylon from rubbing against other types of material. This prevents pilling. The first in our men’s category is Working Person’s Steel Toe Crew Socks. These are cotton with nylon, polyester, and spandex to maintain shape and fit, and are completely washable. They feature an extra thick padded toe and heel. They fight odor and support your arches. The company claims the socks do not shrink in the wash, but as with anything cotton, you may want to pay attention to your washing and drying methods just to be on the safe side. They also can produce some lint balls which might interfere with their wearability. One little thing that causes a headache is the plastic binder in the packaging is difficult to remove. If you have a 2habit of just breaking it by hand, you probably won’t be able to do that here. Make sure that you cut it completely, so you don’t find the plastic piece rubbing your ankle during the work day. Overall, they are soft and don’t slip down your ankles during wear. They are durable enough to withstand heavy use without losing their shape. Might shrink in the wash a bit depending on your laundering methods. 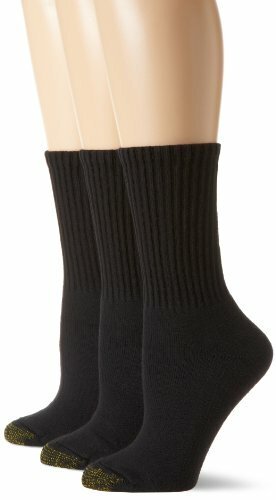 Wigwam Men’s At Work Crew Socks are cotton socks with added acrylic and stretch nylon to maintain shape and keep the socks from slipping. The mixed materials also cut down on shrinkage with each wash and dry. They feature odor control and material to help control fungus, so if you have problems with athlete’s foot, these might be a better choice. The socks are ribbed to maintain shape and feature a contrast foot bed and a smooth toe seam. The material is mid-weight, and synthetic fibers help with breathability especially in the instep. This works with antimicrobial protection to help keep your feet healthy during long work days. A significant feature of these socks is that they are made entirely in the USA by people who know what working people need in work boot socks. They also have a two-year performance guarantee; if they wear out before that time, Wigwam will send new pairs, though the customer must pay shipping. One downside is that they are a snug to tight fit, so they will probably leave marks where the ribbing comes in contact with your skin. Be sure to check the sizing because they don’t stretch as much as other all cotton socks do. 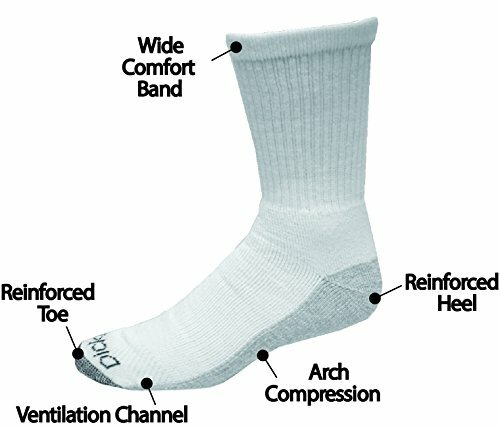 Dickies Dri-Tech Crew socks vary in materials depending on cut and color, but feature arch compression that hugs the feet and prevents slippage through the day. It has dry ventilation channels to wick moisture away, helping to control odor and fungus naturally. The heel and toe are reciprocated for full support, and to maintain shape throughout wear. One positive thing about these socks is that they run more true to size, even for feet that aren’t standard sizing. Men with feet on the smaller side will have a better chance at finding the right fit because of the compression and construction. They are on the thinner size as far as work socks go, so if your job involves extended amounts of walking, they might wear at the heel and toe a little faster than some of the thicker, reinforced socks. The thinner material will work well for jobs that require standing on the feet in outdoor elements, particularly in the summer. Carhartt’s Performance Work socks are made from completely synthetic materials to prevent shrinkage and odor. They maintain their shape better than cotton socks, and offer support for the instep and bracing in the ankle. The material is fast dry, so moisture from outdoor work is handled efficiently. The materials have woven mesh ventilation channels to aid in breathability making them more comfortable for long term wear. They are antimicrobial for odor. The compression arch provides full support without sacrificing range of motion. The fabric maintains the shape needed in the ankle and instep as well as functional compression, but still allows the wearer full range of motion while working outdoors or walking for long periods. They do fit a little tighter and might leave marks that you aren’t used to at the end of the day. This is necessary to maintain support. An upside to these socks is that the feature a more feminine pattern if that is important to you. Might leave marks by the end of the day, especially around the ankle bracing. The second offering from Carhartt is the Extremes All-Season Boot Sock. These are made with a combination of synthetic materials plus wool to help regulate temperature in colder climates. Wool is a better insulator for those extreme cold periods, but the synthetic materials maintain shape and control odor. Mesh vents control bulk, particularly around the ankle. They are breathable and maintain range of motion despite the extra thick insulation. The material is made with FastDry technology to keep moisture from collecting, with polyester wicking away sweat to evaporate outside the sock. The toe is reinforced but smooth for comfort, and the crew style stays in place over extended wear. They are fully cushioned in the lower leg and heel. If you live in areas where the weather gets below zero regularly even in the height of the day, you might want to test them out still. In spite of the insulation claim, the chemistry of each person is different and will require testing to be sure it insulates and protects your feet. Majority synthetic materials for odor control and fit. On the other end of the spectrum is Gold Toe’s Ultratec Crew Socks. These are a majority cotton blend for people who need natural fibers for comfort. Small amounts of nylon, polyester, and spandex are woven throughout to help the sock maintain shape. The heel and toe are reinforced to help prevent wear. The material is also a moisture control blend to prevent odor and wetness. They aren’t equipped with enough compression for people with circulation problems, but you should assess your circulation needs. They wash and dry well, though with all cotton products you should be mindful of your laundering methods. They maintain shape and cotton provides an excellent layer of insulation for colder months. One downside is that the width of the sock might be a little bigger than average. Most people report a great fit, however. The construction doesn’t have a smooth transition from each part of the sock which might make wear more uncomfortable for people with more sensitive skin as well. 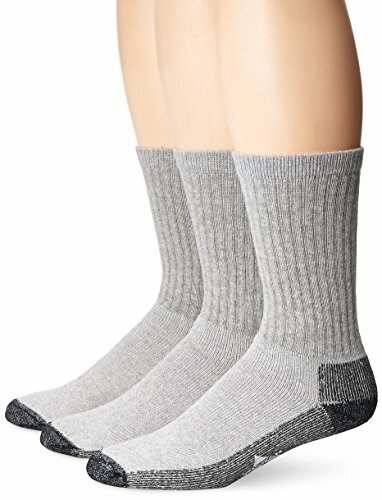 Each sock in this list is an excellent choice for a broad range of jobs requiring the use of work boots, but the overall winners are the Carhartt Women's 3 Pack Force Performance Work Crew Socks and the Working Person's 8766 Grey 4-Pack Steel Toe Crew Socks for men. The Carhartt Women’s socks have a wide range of features that will cross over several types of jobs and needs. They have a comfortable blend of synthetic fibers that provide excellent support and comfort. The Working Person's 8766 Grey 4-Pack Steel Toe Crew Socks for men offers the same range of features as Carhartt’s does for women. The fabric is a blend of synthetic fibers that help maintain shape and the life of the sock. We hope that this list helps you find the perfect sock to wear with your work boots. Also read our expert guide to cowboy boot socks here. Do you have a favorite pair of socks? Let us know in the comments and be sure to share this article with anyone who needs to find a sock to accentuate the fit of work boots.